Recent books about heaven and hell have aroused the interest of committed Christians and curious seekers alike. But the wide range of viewpoints has also created confusion and left many people wondering what they are to believe. This user-friendly guide presents the most popular views on heaven, hell, purgatory, judgment, and related topics, followed by brief, easy-to-follow analysis. Readers will be equipped to make their own well-informed decisions about questions like these: What happens when we die? Where did the idea of purgatory come from? Will our bodies be resurrected someday? If so, does cremation offend God? Will unbelievers be judged by God and punished in hell forever? Or will they be annihilated? What about those who never heard the gospel message? This summary of the latest Evangelical teaching and traditional mainstream scholarship provides readers with tools to assess each position in the light of Scripture. 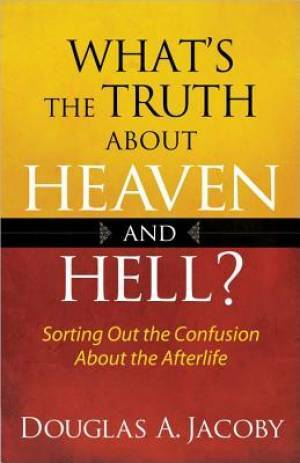 Whats The Truth About Heaven And Hell by Douglas A. Jacoby was published by Harvest House in April 2013 and is our 51682nd best seller. The ISBN for Whats The Truth About Heaven And Hell is 9780736951722. Be the first to review Whats The Truth About Heaven And Hell! Got a question? No problem! Just click here to ask us about Whats The Truth About Heaven And Hell.